Francois Hollande, hero of the fight that vanquished Islamists in Mali is leading France in the battle against dreadful Boko-Haram along five West African countries. The disclosure was made at a press conference in France on Saturday after a meeting hosted by the French president attended by presidents from Nigeria, Benin Republic, Cameroun, Chad and Niger Republic, according to the Punch, a Nigerian newspaper. Countries involved in the plan are empowered to move across international borders in the fight against the terrorists. 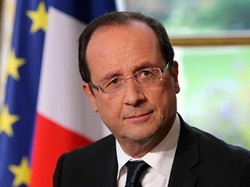 The French president said that France would collaborate with the United States and Britain on intelligence gathering. Although, Boko-Haram's attacks have been against Nigeria, but the war against the sect has become an international affair. Observers see Nigeria as fortunate and Goodluck Jonathan as more fortunate, because it means as Nigeria's president he may still prevail against dwindling popularity at home, and that he will overcome the opposition's belief that he has been carpeted by the Boko-Haram's onslaughts against the country. People believe that with France leading the battle, the abducted girls may eventually be freed. This assurance is predicated on the involvement of Cameroun, Niger Republic, Benin Republic and Chad in the effort against the terrorists. There will be nowhere for the terrorists to flee in their impending running away from the Sambisa forest on the approach of the coalition forces. It is believed that the attack against the terrorists may begin soon, though no time table has been released to that effect.